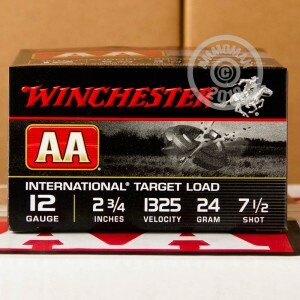 Winchester AA International Target ammunition is loaded to meet the standards of International clay shooting competitions. These 2-3/4" shells are loaded with 7/8 oz. (24 grams) of #7.5 hard lead shot. You can expect an average muzzle velocity around 1,325 feet per second with this ammo. 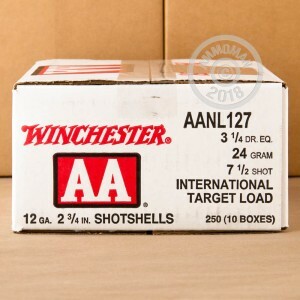 Winchester incorporates several improved components in their AA line of ammunition. The AA wads help absorb recoil and increase pattern consistency, while the stronger hulls improve reliability and are re-loadable. 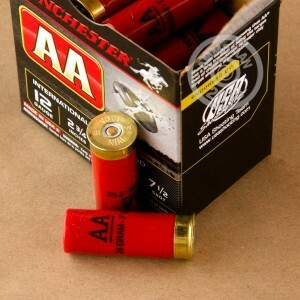 Winchester uses the best in class primers and powders in their AA line of target ammo. Stock up for your next day at the range and save more! AmmoMan.com offers free shipping on all orders over $99!